in this wallie, i'm showcasing what Cagalli was before she became what she is now. 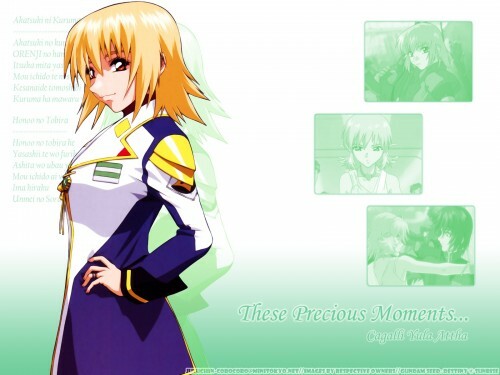 depicting her as a fighter against the Tiger of the Desert (Andrew Bartfeld), as ORB's princess and her relationship with Athrun Zala. a tribute for Cagalli, which includes the songs that was sung when she appears in the series. Hope you all would like it! You can also get Lacus Clyne's Memories Of Yesteryears as well, which is a tribute towards the Pink Princess. top quality image, first one i've seen tonight. the wall is simple yet effective. even tho it is rather simplistic it doesn't feel empty at all. only thing is the text. i'm not sure what purpose it stands [the stuff on the left i mean]. and the writing in the bottom right corner. maybe because the wall isn't overly busy, that text needed to have something to make it stand out and be noticed. or something to at least make it look like its not just an after thought. even a few lines can change the look. Oh i like this its very cute and i like that picture of her in it. nice idea. I like the design, good flow, and nice colours.